Are you a fan of the new logo? Post subject: Re: Are you a fan of the new logo? It's not terrible. I'm fine with it. This. I voted yes, but I don't like it as much as the old one. I like 10acjed's avatar as the new logo. Yeah, if we changed our name to the Miami Jets. Not that I like it, but its better than what they picked. I personally Hate! the new logo. I would think that we would want to put out a message that we are rebuilding to be a strong dominate team of the future, instead our logo looks like it belongs on a rubber raft trying to cut off a whaling ship. (Yes those on the raft have cuts but they don’t intimidate a 700 ton ship.) I can only hope that the uniforms don’t look like they belong in a Broadway chorus line. (Yes I love Broadway but it is not the best image for an NFL franchise.) I have been a dolphin fan my whole life and will always support my Phins, However, I will never be able to support this new logo! Uniforms , logos, and colors don't make a team tough, their play on the field dictates perception. I don't think anyone ever said "Look at that wimpy Csonka guy dressed in aqua coming this way with a fish on his head, he will be easy to tackle." or "Hey, there is Bryan Cox dressed in all white, I bet he will be nice and let me run by him." If colors and logos mattered on the field, then the Raiders would dominate. 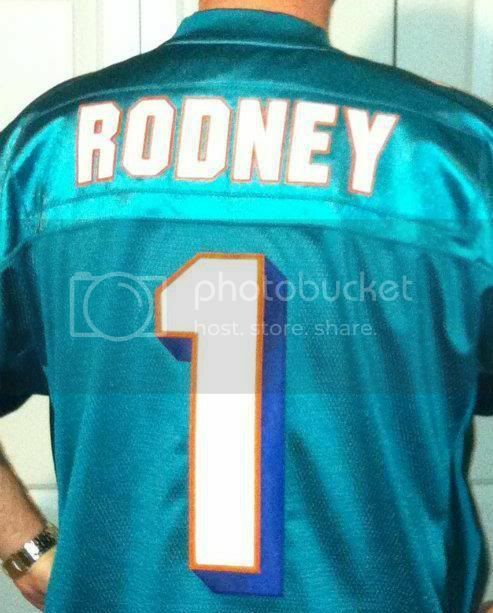 I think the Dolphins have the best colors in all of sports, even more so going back to the lighter shade. I like the new logo. I cant wait to see more of it. Just as always, I get more compliments about the Dolphins from fans of other teams, and more grief from my fellow Dolphins fans. Last edited by rodneyfaile on Thu Apr 04, 2013 7:38 am, edited 1 time in total.